Over a number of years now, the Music Department at St Mary's College has developed an exciting and highly respected extra-curricula ensemble performance program. This large and expanding program gives students an opportunity to experience the personal and public rewards of creating and performing music of a high standard in many challenging, yet stimulating settings. The opening of the Centre for the Performing Arts in August 2006 has given the College a 'state of the art' theatre that offers performance opportunities. The centre includes new instrumental suites that provide first class facilities for our instrumental music program. 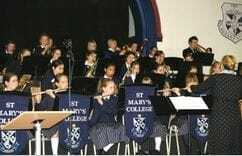 The Music Department involves itself in many school and wider community events. In the past these have included Open Day, Social Justice Day, College Masses, College Productions, Classical, Cabaret and Jazz Nights, Catholic Schools Music Festival, ABODA Band Festival, fundraising events, corporate and private functions. 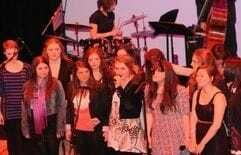 These are great opportunities for students to experience performing to a variety of audiences. The instrumental program facilitates of 280 lessons per week. Instrumental Tutors at St Mary's College are experienced musicians and are well known throughout Adelaide's Music scene. Students can select from a wide range of instruments there are arrangements in place for the hire of instruments where necessary.